Inergy is on a mission to “deliver affordable solar power to the world” and the company is well on their way to say the least. From their office in Pocatello, Idaho, Inergy creates generators, solar panels and accessories that are quickly becoming some of the best in the industry. 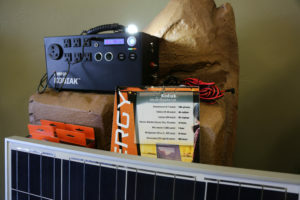 Inergy’s primary product, the Kodiak Solar Generator is portable and powerful. The Kodiak is 66 percent smaller than its closest competitor and weighs just 20 pounds. The compact generator can power a smartphone for over 100 hours, a tablet for over 40 hours, a laptop for over twenty hours, a microwave for 1 hour, a refrigerator for 33 hours, and a basecamp LED light for 183 hours. With that much power, it’s no wonder The Kodiak has been used in so many ways. Inergy’s customers use The Kodiak in tiny homes, camping, during power outages, while tailgating, and in disaster relief. Recently, Inergy launched Empower Puerto Rico – an initiative to bring power to families affected by Hurricane Maria. Nearly 3.4 million residents were left without power after the hurricane. Inergy knew that they had to do something to help. In July, the company launched Empower Puerto Rico, where they donated a full kit to a family in need for every Inergy kit sold. Since then, 46 families now have power thanks to The Kodiak and the Inergy customers that made the donations possible. Inergy is a company that is proud to be based in Idaho and provide affordable, renewable power to the world.